With fabulous natural scenery, ample opportunities for recreation, great schools & affordable housing, Murrieta, CA is a thriving community with plenty to offer. Unfortunately, things can go wrong even in such an idyllic setting. A water leak that goes unattended in your home or business can do some serious damage to your wallet and your property. How can you fight back? Turn to L&S TurnKey Plumbing & Restoration for top-notch water leak detection services. Always available when you need us, we take a non-invasive approach that minimizes damage. Specialized equipment helps pinpoint your problem so that it is fixed promptly with minimum disruption. How do you know you have a water leak? Although a sudden flood can be a clear sign of a problem, other red flags are easier to overlook. Have you heard the sound of water running through your pipes? Is an area of your floor unexpectedly warm underfoot? Does there always seem to be a wet spot near the stucco or outside? Is your gas bill or your water bill going up for no obvious reason? If you answered yes to any of these questions, then you may have a water leak. Why do water leaks occur? Quite a few things can set the stage for water leaks. Pipes degrade over time, so the age of your pipes can be one reason for a leak. Older pipes may be crafted from materials that are less reliable than the pipes produced today. 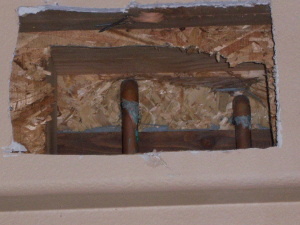 Of course, even new pipes can spring a leak if they are damaged. Mother Nature can also be a factor; abrupt changes in weather and infiltration by tree roots can stress pipes and make them more vulnerable to leaks. Water leaks can get expensive quickly. You may find that you’re paying for water that you did not use. To make matter worse, this wasted water can be a destructive force that damages your property. If you believe that a water leak is present at your home or business, don’t delay. Call a professional immediately. Since pipes are generally hidden from sight, determining the location of a leak without damaging floors, walls and other areas of your home requires a professional touch. At L&S Turnkey, we provide many plumbing services and water leak detection is our specialty. We have the professional expertise and professional equipment to deliver fast, reliable services. When you call us, we’ll use specialized leak detection technology to evaluate your system and identify leaks. This means that we can precisely pinpoint the exact site of any leaks, review the options for fixing the problem with you and provide the necessary repairs. As a local company offering assistance to our customers 24/7, L&S TurnKey takes pride in providing our friends and neighbors in the Murrieta area with quality water leak detection services. If you suspect that you may have a water leak, don’t delay. Call us today to learn more about our services and schedule a visit from our professional team.